I’m excited and I’m stunned. Another award has come knocking on my door! 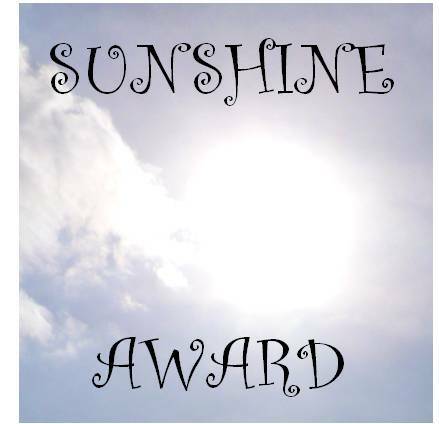 I would like to thank Spasmostar http://spasmostar.wordpress.com for nominating my blog for The Sunshine Award. I’m truly honored. As part of the nomination, I was asked to answer 10 random questions about myself. 1. What is your favorite season? Summer. I miss the heat (and beat) of Miami. 2. What is your favorite dinner food? Freshly made vegetable soup. It’s healthy, warm and delicious. 4. What is your weakness? My two divorces! My failed marriages. 5. What is your strongest point? I’m able to read between the lines. 6. Do you like to cook or bake? Cook. They say cooking is an art and baking is a science. I always was better at art than science. 7. What was your favorite cartoon as a kid? Bugs Bunny. I still watch it. 10. What would be your idea place to live? Hawaii. That was the plan. Make a million with the drugs, move to Hawaii. I should have known that would never work out. Still, one day, perhaps, legitimately, I’ll get there. Ahola, baby! !